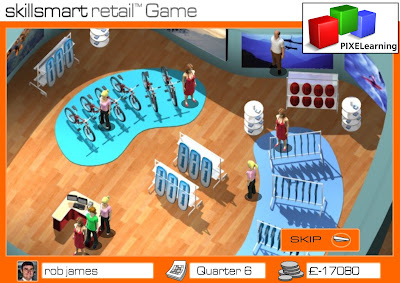 Skillsmart Retail is a genuinely enjoyable game. Although its target audience ranges between 14 to 19 year olds, I've seen some senior retailers and marketers having a great playful time as they go through the various quizzes and game levels. PIXELearning were commissioned to create an online game specifically to help Skillsmart Retail to address the skills shortage in the UK retail sector and to help to overcome the perception amongst British teenagers that retail is a deadend career. 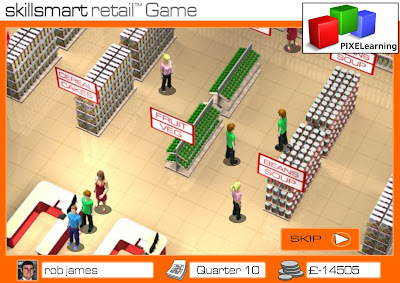 The game is freely available online and allows users to undertake a mini interview before working through four levels in different retail environments with an increasing degree of responsibility. Various implicit and explicit game elements serve to reinforce the key messages that retail careers offer, which are delivered via a case study narrative (audio and text) and hidden messages that can be accessed by clicking on screen. The goal of the game is for players to maximise sales in a retail environment. External ‘events’ will affect possible demand, such as seasonality, and are fed to the user as quick bulletins. PIXELearning also added a public high score table and the ability to set up mini-leagues between friends.